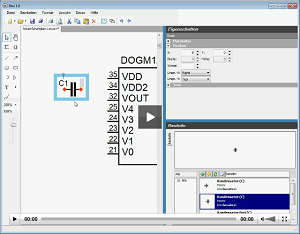 Elwi is a Circuit Layout Designer for free. It has a very simple and intuitive user interface. The main challenge while creating circuit layouts is the placement and re-placement of connections between components. In Elwi there is only one tool for this task. So there is no need to make a choice among many different, not understandable tools. With the help of this tool you can determine which pins of which components have to be linked. The connection than is drawn automatically with a simple algorithm. Often the automatically drawing of connections leads to unwanted effects, e.g. single lines are going through other components. Also very complex algorithms (of other products) do not solve this issue satisfactorily. Hence for Elwi another approach has been choosen: The automatically created connection can be manually manipulated piecewise. This means the way of a connection can be adapted as far as necessary. Elwi has a large component library. This contains all standard components like resistors, capacitors, inductors, transistors, ... and many different IC's. Furthermore it is possible to add individual components. For the creation of IC's you only have to enter the pin allocation of the chip; The graphical component than is drawn automatically. More complex components can be manually drawn as vector graphic. The creation of schematic diagrams is simplified by many other functions. Vector-based componentens can easily be modified by a double-click, even when they are already in use in a schematic diagram. Furthermore it is simple to specify how the schematic shall be printed. The print areas of the single pages can be placed directly in the schematic diagram.